Has anyone else got there s.steel cup holders put in yet? I'll post some pics tonite. yeah I got them last oct and they look awsome. Got mine yesterday, put them in in about 20 minutes. BEAUTIFUL, and just in time for my Shasta trip. I will post pics later. I got mine in this weekend. They look great! The stainless are the EXACT same dimensions as the black ones. So it should fit the same........ Let me know if your short one, I might have an extra to send you. I found mine by the door Fri night. They look great in the Bu. Stewart, I washed them as per instructions, but didn't dry them ASAP and know have small spots of rust on the inside corners. I tried stainless cleaner but did not help. Any suggestions. 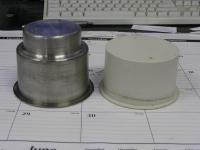 Here is a SS holder next to a 04 VLX bow cup holder. they fit like a glove every where else. Maybe some metal polish like Mother's will do the trick. Send them back. 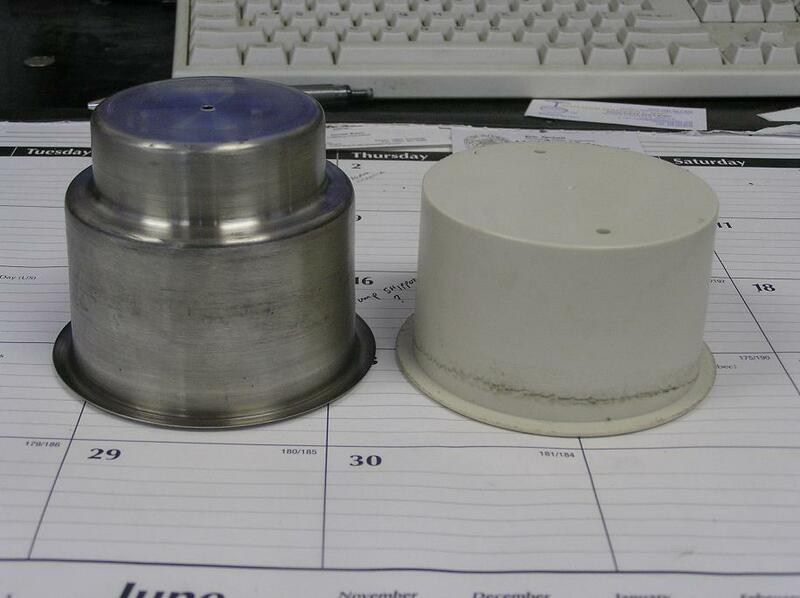 I think the tooling has left some carbon deposits on the cup, and now its the carbon leaving a rust stain. I will fix them. They need to be passivated. My holders in the passenger compartment are the same as yours,the short one's. But my new SS holders fit fine in those locations since there's plenty of room under them. Your Bu should be the same as mine so they should work every place with out modification except the bow. It must be an East Coast/West Coast thing. I have seen smaller grey ones with steps, like in the table and armrest, but I have never seen the short grey ones with no step. I received my cupholders yesterday. I bought 10. Turns out I have 14 cupholders in my boat. 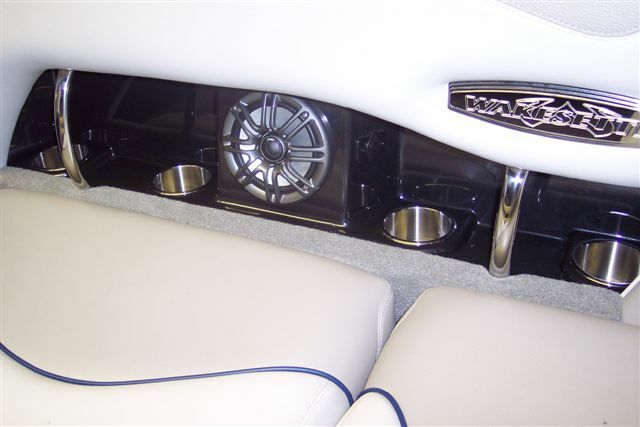 8 of the cupholders in the boat are the standard black ones with drainage. 6 are short beige ones. 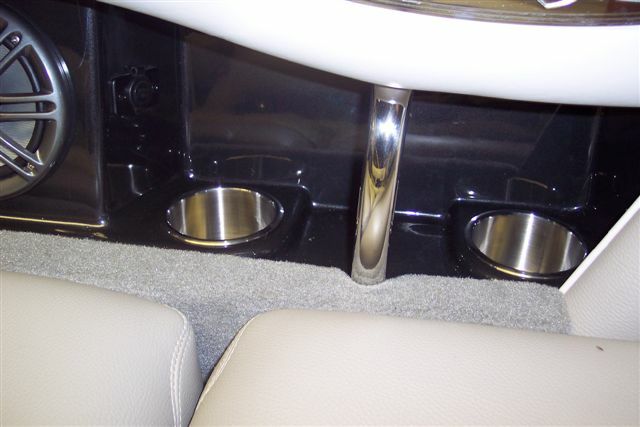 The new stainless ones work great in replacing the black ones but don't work so well in the bow/beige ones or in the fold down arm rest in the back area of our XTI. fortunately I only ended up with two more than I can use and they will do well as spares anyway! Thanks again Stewart! Got mine and they are sweet!! Thanks Stew.